Barbecued prawns in boozy mezcal tomato sauce. Heat oven to 220C. In a 20cm x 30cm baking tray, place 60ml water with the tomato, roast for about 30 minutes until the tops of the tomato pieces are dark and charred. Allow to cool, strain liquid into a bowl and set aside, also reserving the pulp. In a pan over medium heat, toast the clove, cumin and cinnamon until fragrant (about 1 minute), remove and reserve. Remove stems and seeds from the dried chillies, and tear into small pieces. Using the same pan over a medium heat, toast chilli until just smoking (1-2 minutes), transfer into a heatproof bowl, add 1 cup hot tap water and cover with a plate to ensure the chilli pieces are submerged. Allow to sit for 30 minutes, then strain. In a small blender, blitz the spices and chillies, add the roasted tomato pulp and then blitz again. In a saucepan, heat the grapeseed oil over medium-low heat and sweat the onion and garlic until tender (about 10 minutes), season with the sea salt. Add the tomato/chilli mix and simmer until a thick sauce consistency is achieved (keep in mind you still need to add the mezcal). Add the mezcal, cook for a moment and adjust seasoning. 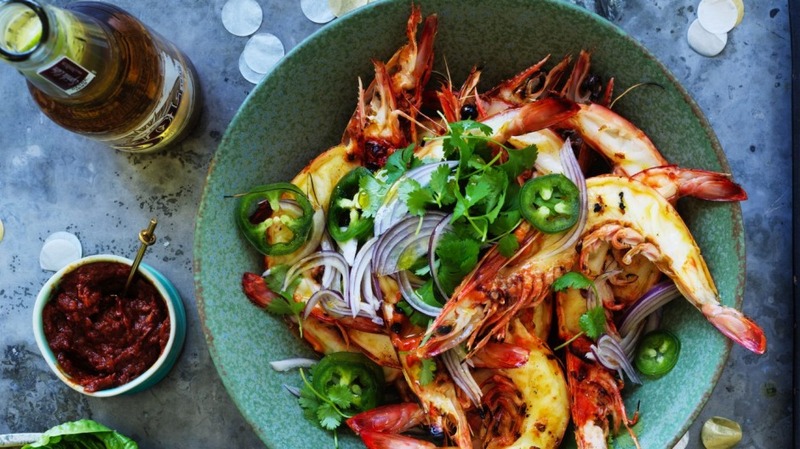 Preheat barbecue to a high heat, drizzle prawns with a little oil and season with sea salt. Grill flesh side down first until lightly charred and just cooked through, (1-1½ minutes per side). Serve with mezcal and tomato sauce and garnish with jalapeno, red onion and coriander.